When Google first introduced gesture controls in Android Pie, many enthusiasts felt Google’s implementation was half-baked. For example, you can only quick switch apps in a single direction, and the swipe up gesture to reveal the recent apps overview often results in the app drawer showing instead. Further, the transition animation between tasks doesn’t feel seamless, and the presence of the back button is hotly contested. Fortunately, we know that Google is working on tweaks to navigation gesture controls in Android Q. We’ve already seen how Google may replace the back button with a gesture and how the transition animation for quick switch may change, but we’ve now discovered more tweaks to gesture controls thanks to hidden flags in the Pixel Launcher. 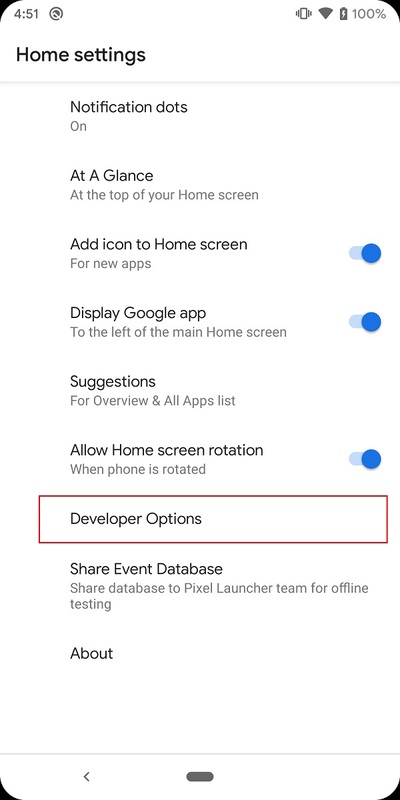 In contrast to the hidden preferences you can access via ADB to modify the gestures in the first Android Q beta, the new gestures we discovered can only be accessed by modifying the stock Pixel Launcher APK to expose its “Developer Options.” XDA Senior Member paphonb, a developer who has worked on rootless Pixel Launcher ports, OnePlus Launcher mods, and the Lawnchair launcher app, modified the Pixel Launcher app to show these hidden flags. The following screenshots show the new “Developer Options” menu in Pixel Launcher’s settings. 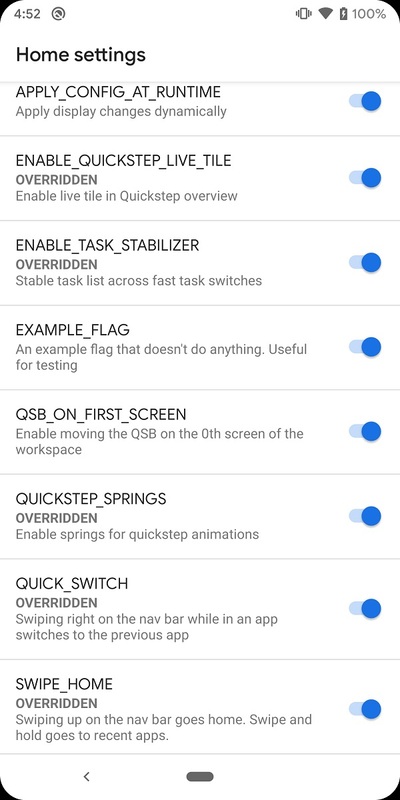 When you open this menu, you have access to a multitude of new settings to control QuickStep, the name of the gesture and recent apps component in Android Pie and Android Q.
Swiping left on the navigation bar can now switch to the task you just left. Overall, these changes make Android Q’s gestures more like the iPhone. The biggest difference is that the back button is still there. Another change introduced with these flags is that you have a much longer time to “undo” accidental task dismissals in the recent apps overview. We’re unsure if these new gestures, or the ones we discovered earlier, will form the basis of Android Q’s revamped gesture controls. Clearly, Google is doing a lot of behind-the-scenes experiments with gestures, so I am expecting major changes to gestures to be revealed during Google I/O 2019. If you want to try these new gestures for yourself, you can follow the short guide down below. Be warned that there are some bugs with these gestures in their current form. For instance, you’ll often see invisible tasks that can’t be tapped on. Download this Magisk Module from AndroidFileHost. I made this module with permission from paphonb and tested it on my rooted Pixel 2 XL. All it does is replace NexusLauncherRelease.apk in /product/priv-app. Find and select the Magisk Module you downloaded. After it installs, reboot your phone. Once you boot back up, open Pixel Launcher settings and you should see the Developer Options menu. For more Android Q news, follow our dedicated tag. If we find any more hidden features, we’ll be sure to let you know.